Just this past weekend, a discussion was had related to that of Cannabis Wheaton Income Corp (TSXV: CBW) between The Deep Dive and an experienced investor. Within, we debated the pros and cons of the company from several different angles. Admittedly, we entered the conversation viewing the company in a rather negative light. This viewpoint largely was the result of the known share structure of the company, and how many insiders made a hefty chunk of change at the expense of shareholders when the company was first launched. However, this experienced investor entered the conversation from the opposite viewpoint – they were very much in favor of Cannabis Wheaton. This was despite the fact that company insiders had a plethora of cheaper shares prior to going public with the company. Rather, they were more focused on the business concept as a whole, the benefit it provides to the sector, and largely the benefit it provides to current shareholders. Alas, we were left with mixed emotions on Cannabis Wheaton by the time the conversation ended. Valid points had been raised by each side, however our opinion at The Deep Dive had changed. This was later reinforced after we took a deeper look in to the company and its latest developments. Here’s our three main points for our current opinion on the company. Largely, a lot of the issue that we have with Cannabis Wheaton dates back to the short time it spent as Knightswood Financial. Of particular focus, is the raise that was conducted on November 16, 2016. Within, the company initiated a raise of special warrants, which consisted of units at a price of $0.055. These units contained one whole share, and one whole share purchase warrant with an exercise price of $0.07 for a period of 24 months. Within the initial news release, the company also indicated that it wished to find investment opportunities in cannabis related businesses. The raise was completed on January 25, 2017, with a total 20,309,182 special warrants issued, for a funding total of $1.1 million. An early warning report indicating that Chuck Rifici owns up to 25% of the diluted share structure of the company as a result of the latest raise. Following this raise, a separate private placement was conducted on similar terms. Again, units were priced at $0.055 each, with a whole warrant at $0.07 which was valid for 24 months. With a total subscription of 18,272,773 units, the company raised an aggregate $1,005,003. This raise closed March 14, 2017. The next day, the company issued 4,238,695 stock options at a price of $0.075 with a five year expiry. These options were issued to new consultants of the company. Nine days after these options were issued, the company announced that they would be conducting a forward split. 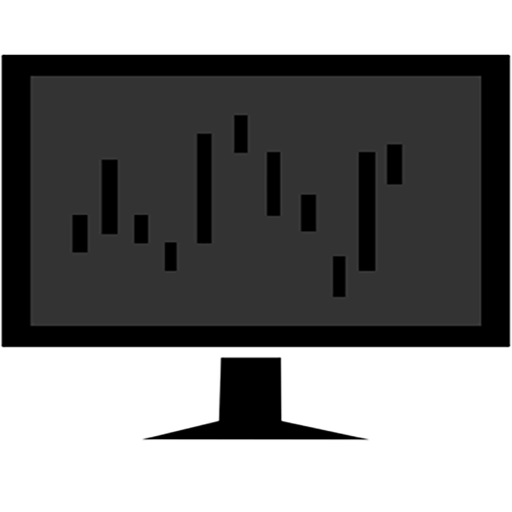 In effect, each shareholder would receive three shares for every one share it currently owned. This in turn brought down the average price per share for current shareholders to 1/3 of what it was previously – literally pennies on the dollar. Lets fast forward a bit now. On April 27, the company acquired PanCann Streaming Corp, the company that would later change its name to Cannabis Wheaton Income Corp. One month following this, the company announced a private placement. Under the terms of the raise, convertible debentures as well as special warrants would be issued. These securities would issue shares at a price of $1.15 per unit. 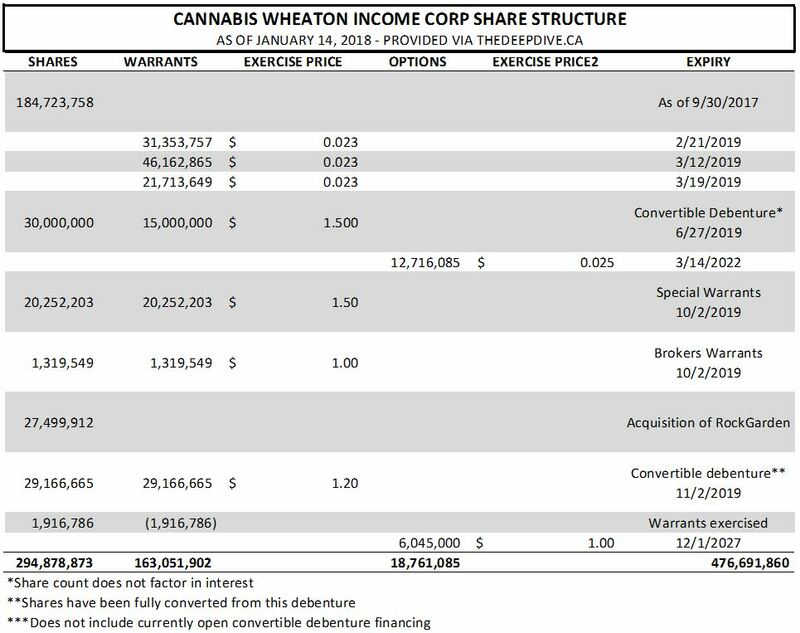 The conflict of interest with Cannabis Wheaton’s equity raise. However, there were major issues with this raise, ultimately of which lead to the raise itself being cancelled. Namely, a number of the co-lead agents for this raise were shareholders themselves as a result of the raises that occurred prior to the stock split. This in turn put them at a great financial gain upon selling this equity financing. Amid public outcry, the planned financing was cancelled. However, repercussions were felt through the industry, as management at Eight Capital changed hands due to the ethics nightmare that was brought on, while the rest of the industry was viewed negatively for a short time by large investors. Additionally, these ethically questionable dealings have left a sour taste in many investors mouths. As a result of the fallout, company stock fell from its previous highs as investors bailed. Further to this, it has left a lasting impression in the minds of many investors, making them leery to invest in the company today. Ethically questionable financings aside, Cannabis Wheaton truly has an innovative and ingenious business plan. For those that are unaware, they act as a “streaming company” to companies in the cannabis sector. What this means, is that they essentially provide funding up front for these enterprises to establish their operations. In return for this, Cannabis Wheaton receives an equity portion of the facility that uses the funding, as well as typically a percentage of all cannabis production. Although it is capital intensive to initially establish, it gets easier as client production comes online. 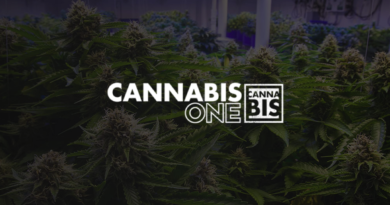 The company can then sell the cannabis that it receives from the partial ownership of the facilities to fund future investments and acquisitions. From here it becomes a major snowball effect as the company continues to grow and provide more investment funding. As an example of how successful this business concept will soon be, here’s an excerpt from the companies investor presentation. Note that this diagram is from late 2017, and as such does not include a number of addition investments in which the company has made. Snippet from CBW’s investor presentation outlining current streaming partners. At the time that this investor presentation was created, Cannabis Wheaton’s total expected production on an annual basis is roughly 235,580 kg. Bases on the companies targeted run rate of $7.75 in revenue per gram sold, it equates to roughly $1,825.7 million in revenues on an annual basis once all operations are producing. In total, this brings the estimated annual capacity of Cannabis Wheaton to an estimated 449,180 KG of cannabis product. At a targeted price of $7.75 a gram, it comes to a mind boggling potential revenue of $3,481.1 million annually. With potential revenues of this magnitude, its clearly easy to see how the aforementioned snowball effect takes hold, funding future growth. Now, all this initial funding for investments comes at a price – a hefty one at that. The share structure of Cannabis Wheaton has taken a harsh beating as of late due to the multiple rounds of financing that the company has required. As it currently stands, it is estimated that there are roughly 294.9 million shares outstanding for Cannabis Wheaton. It is believed that all currently outstanding debentures have been exercised, however the company did not give a final share count figure in relation to the June 27 raise. Once the companies atrocious amount of outstanding warrants are factored in along with the current outstanding options, we receive an estimated fully diluted share count of 476.7 million units. Please note that this does not include figures from the currently outstanding convertible debenture equity financing that was recently increased to $100 million in size. With shares priced at $1.55 each, along with warrants, expect this large raise to have a negative effect on upward momentum for quite some time once it closes. Based on the January 12, 2018, closing price of $2.03, the market valuation for Cannabis Wheaton is roughly $598.6 million. On a fully diluted basis, this figure is increased to $967.7 million. Based on these three points, its fair to say we currently have mixed emotions on Cannabis Wheaton Income Corp. Although they have an exceptional business plan that is working swimmingly, their share structure is less than desirable. The funny business that occurred earlier this year also puts us off from thinking too positively of the company, or at least its management. That being said, they have produced results which needs to be factored in to the equation. They have a well known team of individuals that have a very successful history within the sector. Further to this, they’ve rarely had an issue with actually getting investors to buy in – again, the business plan is excellent. However, even after our dive into the history of this one, we were left questioning what we think of the company. For that reason alone, right now, we’re out. Investing takes faith. If you can’t put complete faith in a company, your money is better elsewhere. Dive Deep. Information for this analysis was found via Sedar, TMXMoney, The Globe and Mail, and Cannabis Wheaton Income Corp. The author has no securities or affiliations related to this organization. Not a recommendation to buy or sell. Always do additional research and consult a professional before purchasing a security.